Diego Costa scored twice as Atletico Madrid went top of La Liga for 24 hours at least with victory over Levante. Levante led after 59 seconds when Andreas Ivanschitz fired home but Diego Godin headed home an equaliser. Costa put Atletico ahead with a close-range volley only for Pedro Rios to level following a run from the halfway line. 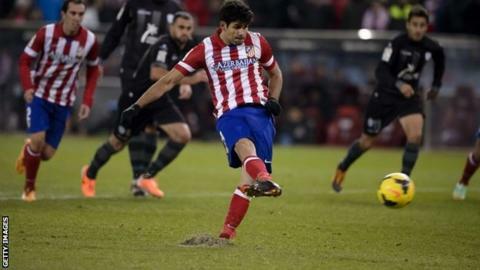 But Costa scored again, this time from a penalty, to win it for the hosts and 12th-placed Levante had Juanfran sent off late on for an off-the-ball clash with Filipe Luis. Costa's 18th and 19th goals of the season take Atletico three points clear of Barcelona, who are away to Getafe on Sunday. If Barca fail to win or only win 1-0, Atletico will be top of the table until at least 5 January - after Spain's winter break. Atletico Madrid's win over Levante took them three points clear of Barcelona and eight above Real Madrid - albeit having played a game more. Diego Simeone's side have only dropped points in two league games this season but their defence seemed to be half-asleep when Austrian Ivanschitz was played through and fired past Thibaut Courtois, who got a touch but was unable to keep it out. The hosts levelled when defender Godin headed home Juanfran's right-wing cross. The Uruguayan almost scored a second when he blazed over the crossbar with a left-footed volley. Two minutes after the break Costa made himself the top scorer in La Liga this season when he snuck in behind the Levante defence to fire home with a first-time finish. And just when it looked like the hosts were cruising, 32-year-old Rios ran 40 yards before shooting past Courtois. But as he has been on many occasions this season, Costa was Atletico's hero with a match-winning goal. His 77th-minute penalty, which was almost saved by Keylor Navas, came after Atletico's Juanfran nipped in ahead of Ruben Garcia and was brought down. As the game was entering injury time, Levante's Juanfran was dismissed after clashing with Luis in the box and their hopes of scoring an equaliser went down the tunnel with him. Match ends, Atlético de Madrid 3, Levante 2. Second Half ends, Atlético de Madrid 3, Levante 2. Attempt missed. Diego Costa (Atlético de Madrid) right footed shot from the centre of the box is close, but misses to the right. Assisted by Adrián with a through ball. Attempt missed. Rubén García (Levante) right footed shot from outside the box is too high following a corner. Corner, Levante. Conceded by Adrián. Juanfran (Levante) is shown the red card for fighting. Corner, Levante. Conceded by Tiago. Sergio Pinto (Levante) is shown the yellow card for a bad foul. Diego Costa (Atlético de Madrid) wins a free kick in the defensive half. Foul by Sergio Pinto (Levante). Attempt saved. Pape Diop (Levante) header from a difficult angle on the right is saved in the centre of the goal. Assisted by Sergio Pinto with a cross. Substitution, Levante. Sergio Pinto replaces Simao. Substitution, Levante. Ángel replaces Pedro López. Corner, Atlético de Madrid. Conceded by Pedro López. Pape Diop (Levante) wins a free kick on the right wing. Loukas Vyntra (Levante) wins a free kick in the attacking half. Goal! Atlético de Madrid 3, Levante 2. Diego Costa (Atlético de Madrid) converts the penalty with a right footed shot to the bottom right corner. Penalty Atlético de Madrid. Juanfran draws a foul in the penalty area. Penalty conceded by Rubén García (Levante) after a foul in the penalty area. Foul by Pedro Ríos (Levante). Arda Turan (Atlético de Madrid) wins a free kick in the attacking half. Keylor Navas (Levante) wins a free kick in the defensive half. Corner, Atlético de Madrid. Conceded by Pedro Ríos. Attempt blocked. Tiago (Atlético de Madrid) right footed shot from outside the box is blocked. Assisted by Diego Costa. Pape Diop (Levante) is shown the yellow card for a bad foul. Diego Godín (Atlético de Madrid) wins a free kick on the right wing.